The figure below illustrates how various services and data can be assembled together to get the best use of/ROI for your spatial data. A variety of spatially-related data can be stored in one or more spatial stores within your organization. This data can be accessed through spatial viewers both embedded in Maximo, and also viewed through separate stand-alone viewers such as Google Earth, Google Maps, Microsoft Bing Maps, etc. 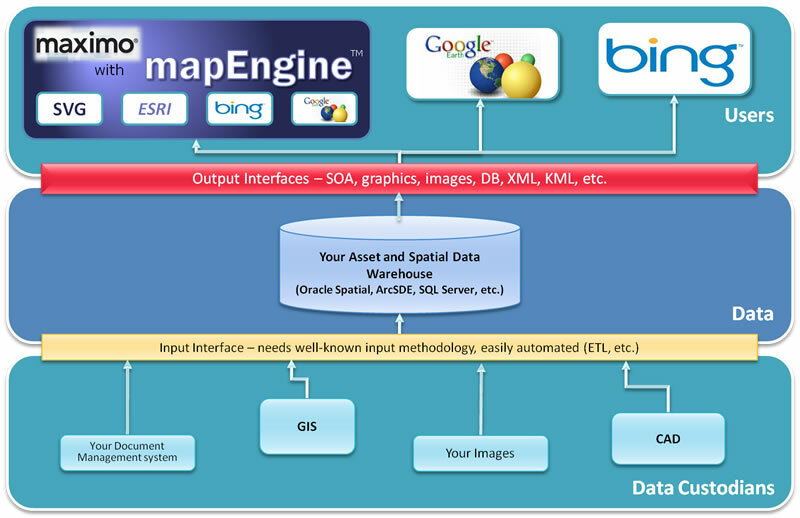 Once the viewers are embedded into to Maximo/MapEngine, users can perform any asset-related transaction through the map interface. This configuration allows the customer the benefit of directly accessing asset and work-related GIS data while inside Maximo, and at the same time it provides a path for future growth when the need for accessing non-asset data via a map becomes important. And if you’re a MapEngine user, it doesn’t matter where you store the data. So whether your GIS data storage preference is Oracle Spatial, ArcSDE, SQL Server, flat files, or some other data warehouse, MapEngine can deliver that data visually inside Maximo. This entry was posted in about activeG, MapEngine and tagged GIS, Spatial on April 25, 2011 by ActiveG.